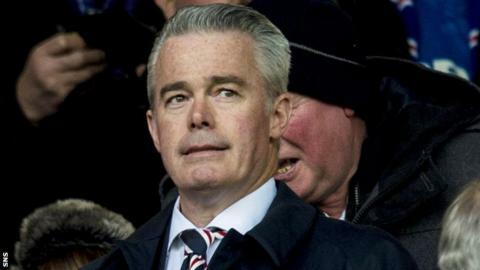 Paul Murray can formally take his place on Rangers' board of directors after being passed "fit and proper" by the Scottish FA. The SFA's professional game board considered Murray's previous role as an Ibrox director in the years preceding Rangers' insolvency in 2012. Interim chairman Murray was one of several shareholders who took effective control of Rangers last month. The full SFA board is assessing Dave King's suitability for the Ibrox board. South Africa-based King's tax convictions and his previous role as a Rangers director in the years running up to 2012 also mean the SFA board must decide whether he satisfies their guidelines. Of Murray's situation, the SFA said in a statement: "The Scottish FA can confirm that at a meeting of the Professional Game Board (PGB) on Thursday 30 April, consideration was given to the fit and proper status of Mr Paul Murray as a director of Rangers Football Club in respect of Article 10.2 of the Articles of Association. "This followed a submission from the club of an amendment form to its official return. Specifically, Mr Murray was invited to provide information in relation to his involvement as 'a director of a club in membership of any national association within the five-year period preceding such club having undergone an insolvency event'. "The PGB examined Mr Murray's involvement as a director of Rangers FC in the five years preceding the insolvency event experienced in 2012. "Particular focus was given to Mr Murray's role and function as director, any financial benefit or otherwise from the insolvency event, steps taken to avoid the insolvency event, co-operation throughout the insolvency event and intentions as a director to avoid a repetition of the mistakes of the past. "Having considered the documentation provided, and taking into account Mr Murray's detailed personal submission before it, the PGB is satisfied that Mr Murray is fit and proper in terms of Article 10.2."